Please see our Special Offers Page for some Great Spring / Summer Discounts ! We are pleased to offer 3 New Bavaria Sailing Yachts to our Charter fleet ! 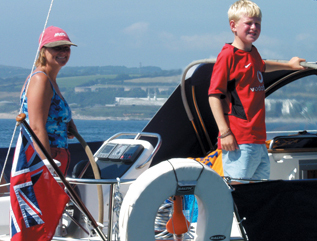 Improve your sailing with experienced instructors offering Royal Yachting Association courses. We run RYA courses from our base in Falmouth for yachting weekends, cruising, one day, theory, radar, first aid, sea survival and yachtmaster qualifications. Whatever your ability we have approved sailing courses for beginners, intermediate and advanced levels. What better grounds to learn to sail in or take a holiday. With Cornwall's warmer climate we have boats sailing on the water all year round. 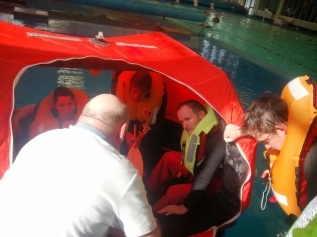 We offer a full range of powerboat courses including a practical introduction to boat handling skills, International Certificate of Competence, pilotage, passage handling, safety and advanced training. Our experienced instructors are available for training all aspects of motorboat handling including helmsmanship, engine maintenance, pilotage, navigation, seamanship in tidal waters, coastal and offshore waters. 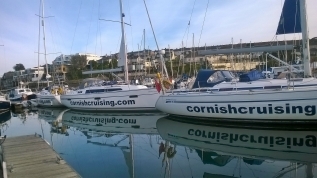 Cornish Cruising is a yacht charter company & RYA Training Centre based in Falmouth, Cornwall, home to one of the largest natural harbours in the world and a hive of activity for cruising enthusiasts. Falmouth and the south coast of Cornwall boast some of the best and most protected sailing and cruising grounds in Europe - whatever the weather and season! With sailing events and regattas throughout the year, and a thriving town which is steeped in maritime history, Falmouth is the perfect base for your charter holiday. Cruising the South West provides endless opportunities to explore the beautiful local estuaries and creeks. Enjoy a sail to a picturesque pub at the water's edge, anchor off a secluded cove or simply anchor in Carrick Roads and watch the world go by. Day sails and coastal hopping give good access to the delights of Cornwall, Southern England, France, Northern Brittany, the Channel Islands and the enchanting Isles of Scilly, or just a little further and you can explore Southern Ireland. Whatever the wind direction, Cornish Cruising has the answer! 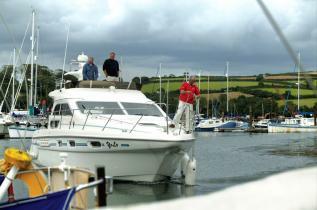 Charter in Cornwall with Cornish Cruising and experience our way of life and love of the sea. We are pleased to announce the addition of "Toba-go" a Ribeye 785 Sport Rib complete with 300hp Yamaha to our Fleet!! We now have recognition for the MCA AEC Course. Please see MCA Section on course page for details and course dates! We now have recognition for the MCA HELM (Operational) Course. Cornish Cruising now has recognition for PWC (Jet Ski) Training, and is also bringing in two New Jet Skis for Jet Ski Safari`s ! Please call to confirm a booking. 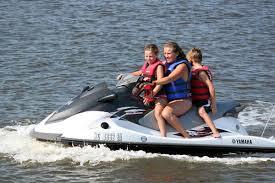 We are now offering 2 hr Jet Ski Safari`s on our Brand New Seadoo Spark Jetskis ! These skis are capable of speeds over 50 Knots!